California Tea House has provided me with Titanic Blossom for the purposes of providing an honest review. I love blossoming teas. There’s just something really magical about the artistry that goes into these beautiful hand-tied works of art. 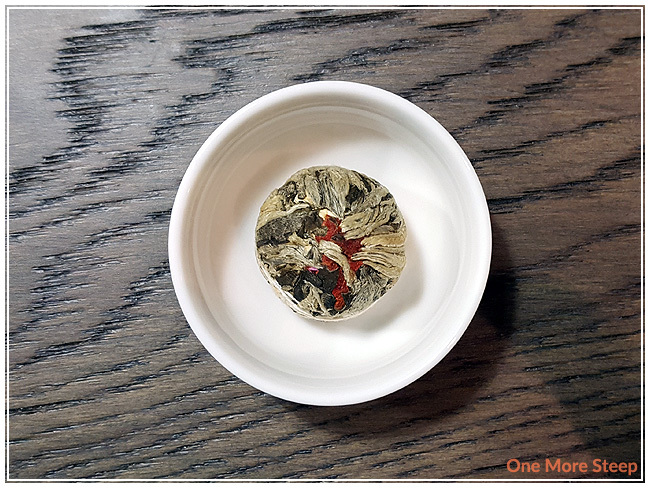 If you’re not familiar with blossoming teas, they are these tea balls that open up when steeped to reveal beautiful flowers inside – and I personally think they’re a real treat. These are definitely not teas that you would pop into a travel mug – you’ll want to sit down and enjoy the full steeping process and watch these balls open up! 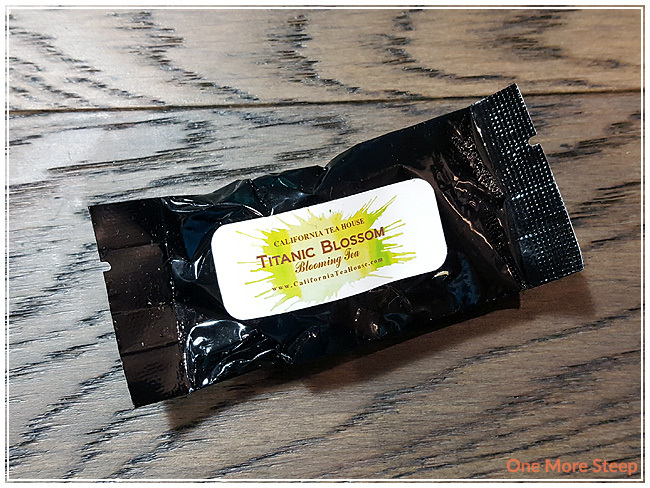 Titanic Blossom came to me as an individually packaged tea ball. 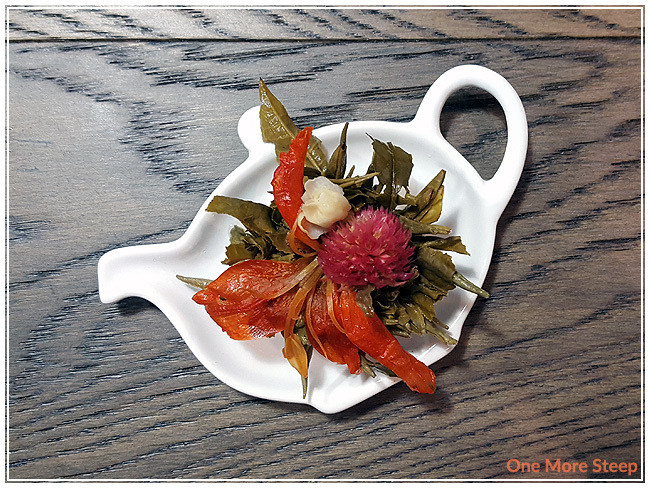 For this particular blossoming tea, it consists of silver needle (white tea), globe amaranth, jasmine, and peony flowers. The aroma from this tea ball is very subtle – I mostly smell the jasmine. California Tea House recommends steeping Titanic Blossom in boiling water for 4 to 6 minutes, until the flowers have opened up. I steeped Titanic Blossom for 5 minutes. Titanic Blossom steeps to a reddish orange, with full blooms of the globe amaranth, jasmine, and peony – one of each. The aroma is very floral, and has a hint of sweetness. 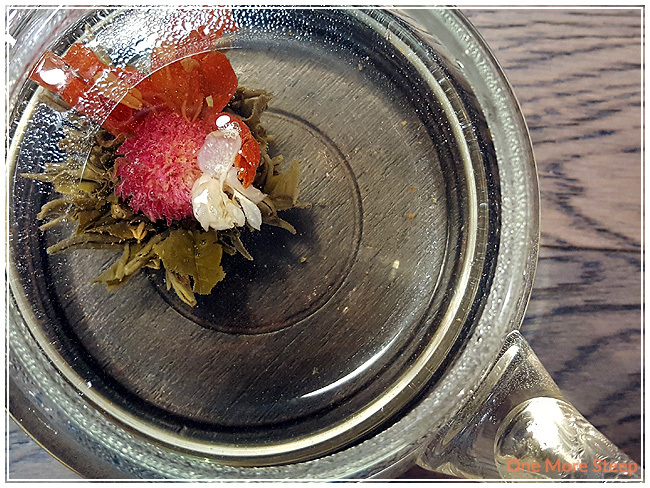 As you can see from the image below, the flowers open up and are in nest of the silver needle tea leaves. 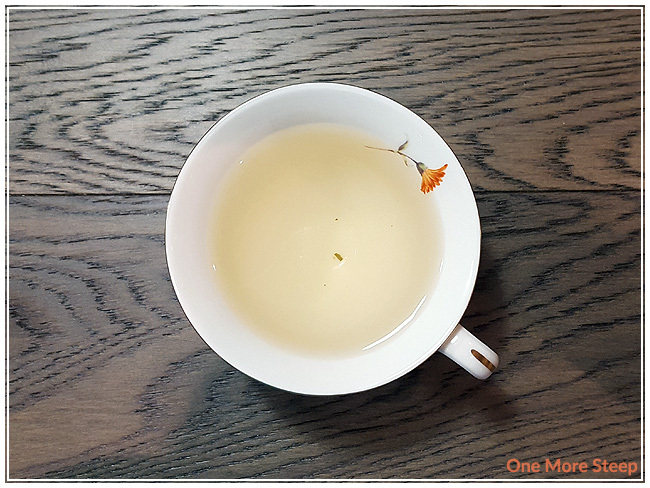 The flavour of this tea is quite floral – there’s a touch of sweetness, and I can taste the white tea base as well – it lends a nice crispness to this tea. I like the smoothness to this tea, it has a great flavour to it. I really enjoy the sweetness in this tea though, I’m not sure if that is a quality from the flowers or the silver needle, either way it goes well with the floral notes. The jasmine is noticeable and can be picked out, but isn’t to the point where it overwhelms the other floral aromas and flavours. I resteeped Titanic Blossom twice, and found that the floral notes were considerably less compared to the initial steep. The silver needle flavours were still present, so it was less floral but still remained sweet. It makes for a nice cup of tea still, even with less floral notes. I loved California Tea House’s Titanic Blossom. I love blossoming teas because it’s entertainment and a tea, all in one. I would definitely recommend steeping this tea in a clear glass teapot, so you can get the full experience. The flavours in this blend of silver needle and flowers is delicious and well balanced. I think it would make an excellent iced tea – and how appropriate would those flowers be in the summer? 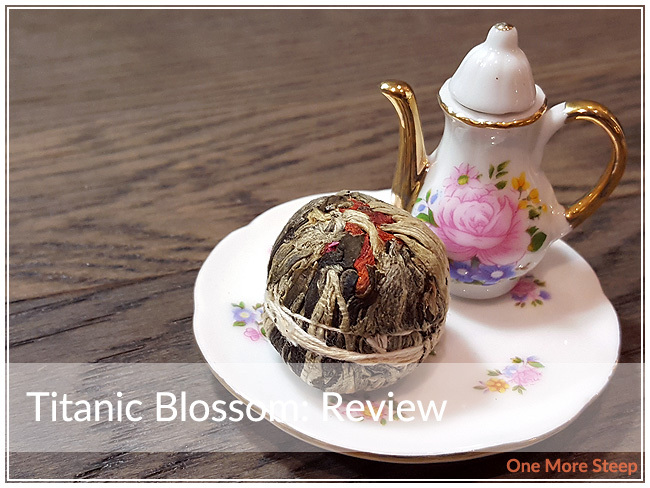 I understand that blossoming teas always seem to be on the more expensive side, but I think you do need to take into consideration that it is a hand-tied floral arrangement inside of tea. It’s obviously not really an ‘every day’ sort of tea, but more of a tea for a special occasion or a #treatyoself moment and $3USD for a fancy treat doesn’t sound too bad!